City leaders will ask the Scottish Government for help to foot the bill for a potential £145 million extension of the tram line to Leith. Cost estimates have been published in an outline business case, which will be tested against quotes provided by construction firms interested in carrying out the work. 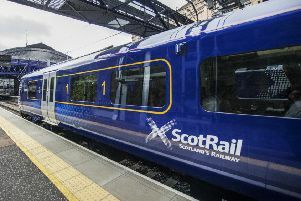 Council chiefs said a government grant was one option being considered to help pay for the line, despite the SNP administration’s previous insistence that it would pay “not a penny more” towards the troubled project. The Scottish Government today said it had “no plans” to make a further contribution, but would be willing to discuss the issue with the council. However, city transport convener Councillor Lesley Hinds said the city would approach ministers regardless, saying tram projects in England and Ireland had been funded with taxpayers’ cash. She said: “The Scottish Government have said they would not give any further resources to the Edinburgh Trams, but obviously we would still like to have discussions with them. Four options have been set out for extending the line, with proposals to take the tram to the foot of Leith Walk, Ocean Terminal and all the way to Newhaven – as originally planned eight years ago. However, the fourth, extending the line only as far as McDonald Road, has effectively been ruled out as uneconomical. The report sets out the estimated costs for each of the options, with Newhaven coming with a price tag of £144.7m, while the Ocean Terminal option would cost £126.6m and Leith Walk £78.7m. If the line was fully extended to Newhaven, officials believe it could almost double passenger numbers by 2027, with up to 18.7 million journeys per year. Based on the tram’s existing business plan, that could boost ticket revenues by up to £17m, helping the service turn a larger operating profit and allowing the city to break even on its investment earlier than the 15 years currently predicted. Other sources of funding being considered alongside a government grant include EU finance, private investment, or using funds from a City Deal bid being prepared which could unlock billions of pounds of infrastructure investment. Cllr Hinds added: “I am extremely pleased with the progress of the business case, which already shows the clear economic impact the extension of the tram line could have. “In the tram’s first year of operation we have seen passenger numbers increase, making the case for extending the tram to benefit people elsewhere in the city. But we don’t want to make any rash decisions, and that’s why further due diligence is required. Cllr Hinds pledged that all information gathered during market research and auditing of the business case would be made available to councillors in a “data room”, where they could browse commercially sensitive quotes for “weeks” before any decision was taken. Councillors will decide which option to take forward in the autumn, but supporters of extension face an uphill battle to convince sceptical SNP members to back the tram. Earlier this year, the party signalled it was willing to put aside long-standing antipathy to the tram if the business case was sound. But a senior SNP source said it could still decide not to back any option if the plan was deemed too expensive. Conservative transport spokesman Nick Cook questioned the council’s ability to fund any extension. The spokesman added that the government was “committed to working with all our cities to unlock investment”. Leith residents will face considerable disruption in any tram extension, with city officials revealing that hundreds of underground pipes and cables could still have to be moved. Despite years of works to divert water and gas mains as part of the original tram construction project, up to 1200 potential obstacles still sit beneath Leith Walk, with the majority of them likely needing to be moved. Transport convener Councillor Lesley Hinds said she was “surprised” the figure was so high despite previous works, but said it was important that the city approached any extension plan with caution and anticipated possible problems.